Digital Alchemy | Digital Alchemy wins Bronze for Best Regional Recruitment Programme! Digital Alchemy wins Bronze for Best Regional Recruitment Programme! 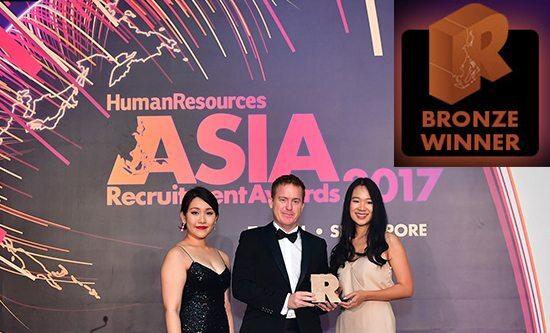 Digital Alchemy is proud to have won the bronze award for ‘Best Regional Recruitment Programme’ at the recent prestigious Human Resources Asia Recruitment Awards held on 7 April in Singapore. Ryan McHutchon, Head of Talent & Team Development said, “Our most important asset is our team and this award is a testament to our passion and hard work to attract the right talent as we continue to innovate and deliver cutting-edge marketing solutions to our clients”. Judged by a panel of eminent and senior HR practitioners, the Human Resources Asia Recruitment Awards is a regional recruitment awards show that recognises and celebrates the best in recruitment and talent acquisition in Asia. This award is not the first award Digital Alchemy won; in July last year, DA won Silver for ‘Best Loyalty Programme (Retailer)’ & Bronze winner for ‘Best Innovative Loyalty Programme’ at the Loyalty & Engagement Awards in Singapore.